With a starting climb of 2,612 vertical feet in 2.8 miles at high elevation, this race packs a punch. It is summertime, and I stand in the cathedral of northern New Mexico’s Taos Ski Valley, preparing to race the Taos Ski Valley 10K Up & Over Trail Run. On a clear day, I would be able to see the state’s highest point, Wheeler Peak, from the valley, but clouds obstruct it, as well as the high point of today’s race—the top of a chairlift just below the Highline Ridge, which leads to 12,481-foot Kachina Peak. A rookie to this race, I nervously toe the starting line with locals, or Taoseños, and others who have run in previous years. I ponder the 2,612 vertical feet in the 2.8 miles of trail leading to the summit. At the start, we’re already at an elevation of 9,207 feet. 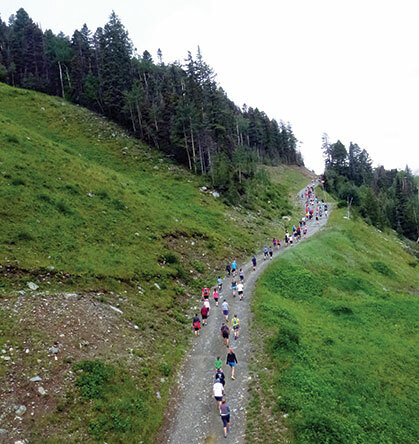 The Up & Over Trail Run is jointly hosted by the Taos Ski Valley Area Chamber of Commerce and the resort company Taos Ski Valley Inc. on resort property and Carson National Forest lands. 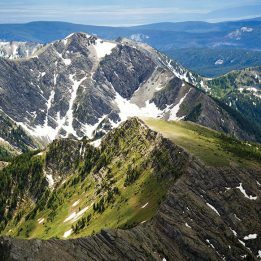 The valley is located in the stunning Sangre de Cristo Mountains, 35 minutes from the laid-back, artsy community of Taos. The Swiss-inspired architecture of the valley’s ski village stands in stark contrast to the adobe pueblos common to northern New Mexico. 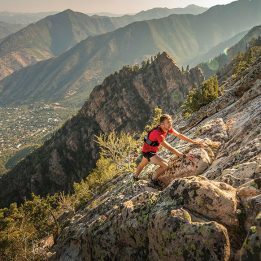 Locals seeking a difficult trail race organized the event in 2006 to highlight the beautiful vistas and steep terrain found throughout the Taos area. 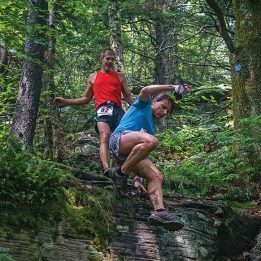 Up from 30 participants in its first year, Up & Over attracted 147 runners of all ages, from nine to 86, and abilities, from well-acclimated local competitors to casual runners looking for a short but demanding trail run on a combination of cat tracks, rocky singletrack and well-worn earthen paths. Starting at the iconic pagoda located at the base of the Taos ski area, we follow a steep cat track halfway up the mountain. Training at my home’s moderate, 4,500-foot elevation has been insufficient to prepare me, and soon my legs and lungs burn. Like many other racers, I switch from an ineffectual shuffle to a power hike, and focus on reaching the summit, hidden somewhere above the last pitch of the trail. I finally break free of the oppressive cloud layer and am greeted with a clear view of the race’s 11,819-foot zenith, a treeless, rocky ridge. At the top, runners receive shouts of well-deserved encouragement from volunteers who have taken the chairlift to the summit, then plunge down the mountain’s far side on the loose scree that comprises the Honeysuckle Trail. I follow the few runners ahead of me, and as echoes of the volunteers’ inspirations fade, they’re replaced in my head by an old fell-running adage: “Brakes off, brain off.” I accept the controlled falling that is a mountain-running descent, and welcome the strain of new muscle groups. Through an oxygen-starved brain, I mutter to my screaming quads and hamstrings, “Shut up and run it,” an adaptation of the bumper-sticker slogan once seen throughout Taos that expressed locals’ views on the snowboarders carving these hillsides. I drop down the mountain’s east side on the Honeysuckle Trail and hurdle two ephemeral, snowmelt-fed streams, trying fruitlessly to reel in time lost on the ascent. I follow a stony cat track below treeline and weave between shimmering aspen groves. I am awed at the beauty of the surrounding peaks, humbled by my small place in this geologic wonder. After making the final turn onto the smooth, singletrack Rubezahl Trail, I tear down the hillside to the welcoming shouts and applause of hundreds of Taoseño spectators and volunteers. The clouds finally start shedding their precipitation shortly after I cross the finish line, so we dash indoors, where age-group winners receive unique clay medals, handcrafted by artisans in neighboring Arroyo Seco. I revel in the day’s successes as the smells of European-influenced food and the sounds of live music begin to fill the village air. Getting There: Fly into Sante Fe or Albuquerque; both airports have direct shuttle service to the Taos Ski Valley. Or, from the town of Taos, drive about 20 miles north on U.S. Highway 64 and State Highway 150. Accommodations: In the Ski Valley, book a room at the Alpine Village Suites or find a vacation rental (taosskivalley.com/pages/stay/Taos-Ski-Valley), or in town, try the Historic Taos Inn, housed in 19th-century adobe structures in Taos. Camping is also available in Carson National Forest. Post-Race Grub: The oldest brew pub in New Mexico, Eske’s Brew Pub, serving famous green chili stew (and green chili beer, for the strong of heart), is located just off the plaza in Taos. Or for ribeye nachos and mezcal, look to the Adobe Bar, located in the Historic Taos Inn. In the Ski Valley, the Bavarian Restaurant & Lodge adds a little Alpine flavor with Bavarian cuisine and German beers on tap. Bonus Run: The Devisadero Trail is a 5.6-mile loop on the outskirts of town with an excellent view of the expansive Taos Valley. It gains just over 1,400 feet, topping out at 8,304 feet. Hayden Janssen lives in Helena, Montana, with his wife and two dogs. He is co-owner of Primitive Mechanix, a consultancy that promotes running through participation, education and community outreach. He constantly seeks the sublime.